I had built up quite a back log of apples, even though I have been steadily using them for dried fruit, savory apples, and serving them sliced with peanut butter as snacks. 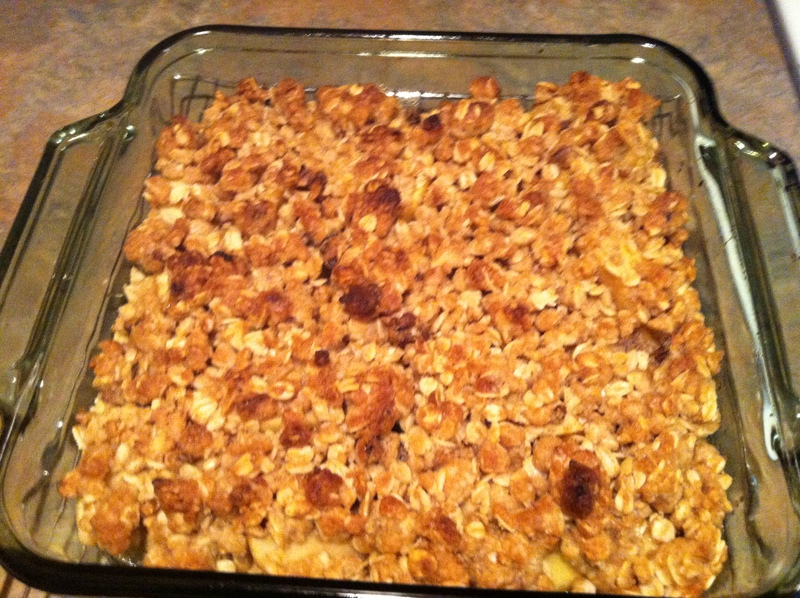 One of our favorite apple dishes is apple crisp from Cook’s Illustrated. We discovered this recipe about two years ago, and keep coming back to it for Thanksgiving, pot lucks, fall breakfasts…. I actually follow their recipe better than I do most, with changes for lack of certain ingredients in my kitchen at the time. For example, today I am out of lemon juice, so I used Key Lime juice. I used instant cider. I dislike peeling and coring apples. But I do think this recipe is best with peeled apples. 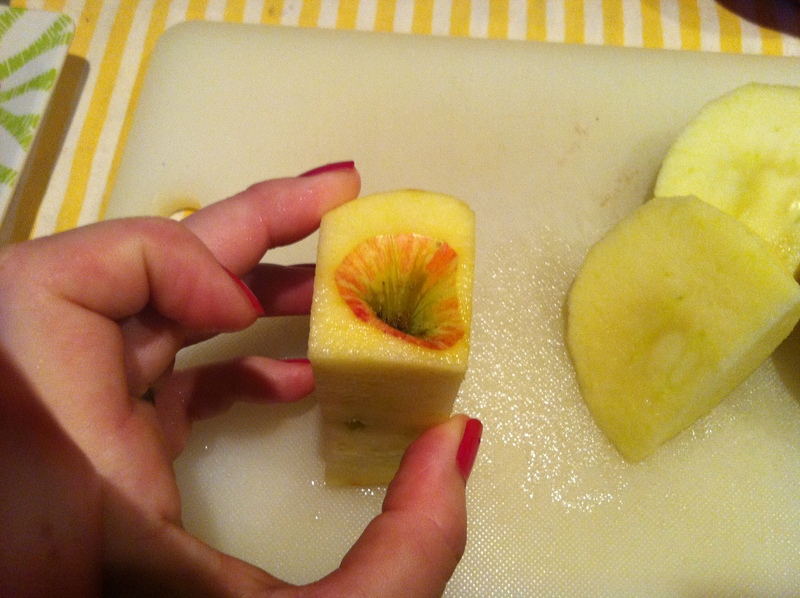 However, rather than using a corer, then trying to make flat slices from round wedges, (The comments on CI talk about even thickness of the slices helps the apples cook evenly), I segment my apples by slicing off one side after the other and end up with a square core. I can’t explain it very well, so we have pictures. 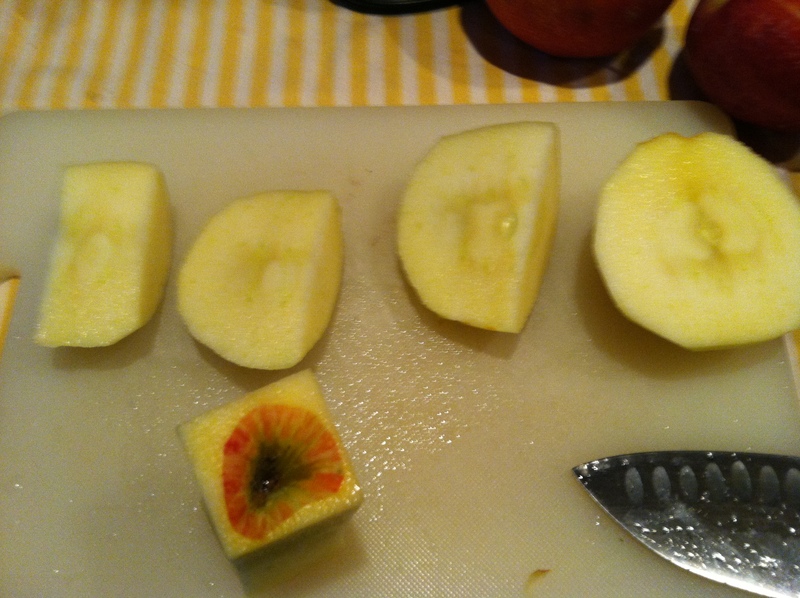 I slice each of the apple sections into 1/4 flat slices, then toss with the cinnamon and sugar. The CI recipe uses an oven safe skillet for a one pan recipe. 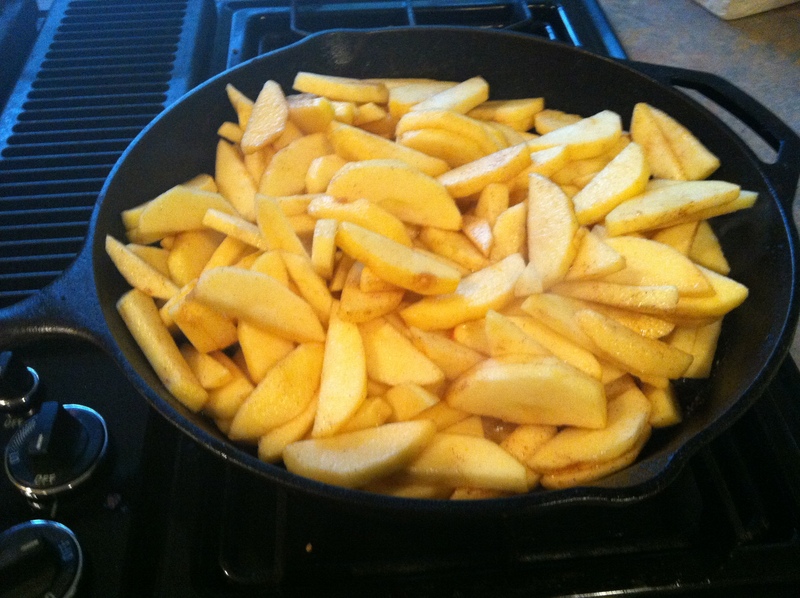 Today, I decided to use my 12″ cast iron skillet (which I had made breakfast potatoes in yesterday). I was curious about what flavors that would add to the apple crisp, AND what flavors that will add to whatever I cook in this pan next. and simmer until reduced by 1/2. Pour concentrated cider into a cup and add 2 t. key lime juice. Add apples to skillet and cook, stirring frequently for about 12-14 minutes. 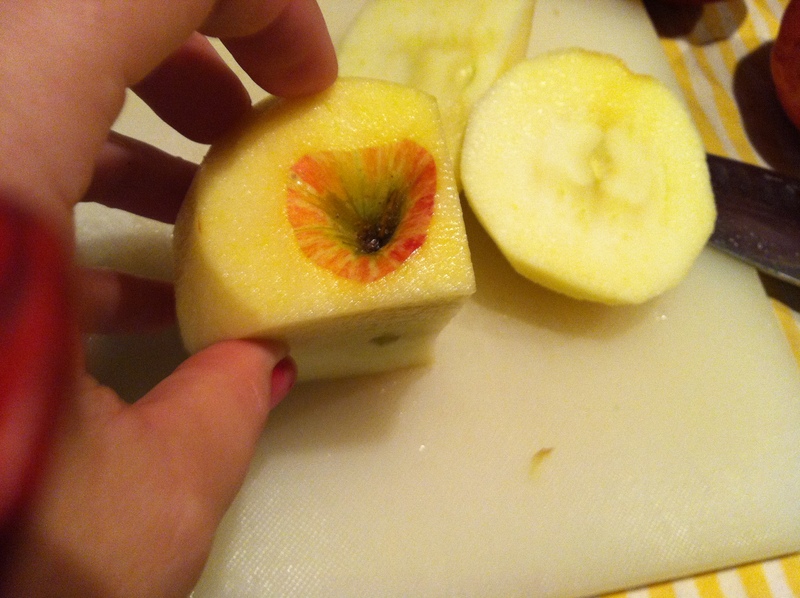 Do not fully cook the apples. Pour the cider mixture over the apples and toss gently to coat. CI adds the topping now and puts the skillet into the oven to cook. 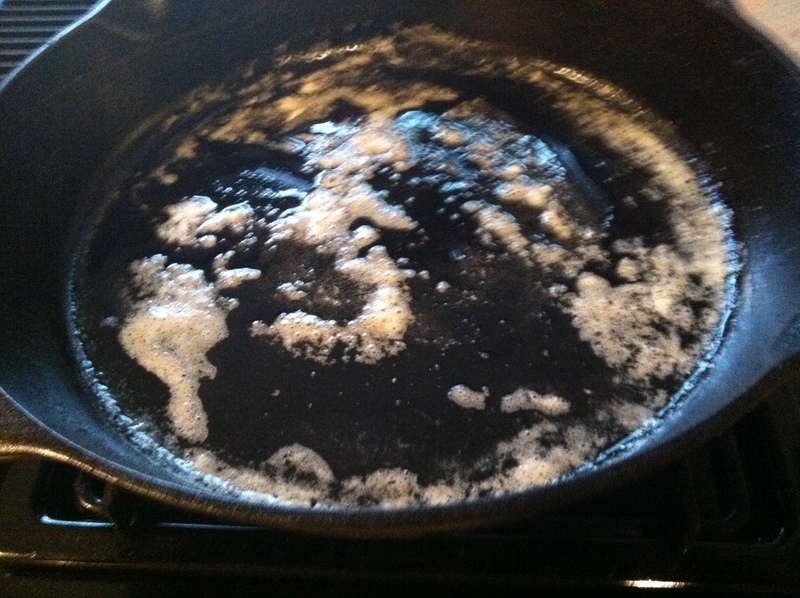 But I like to split the recipe between two 9″x9″ pans and have one for now and freeze one for later. I divide the apple mixture between the two pans, then divide the topping evenly between the two pans. Bake the crisp for 15-20 minutes until the topping is dark brown. Disposable pan with lid and instructions to bake later. 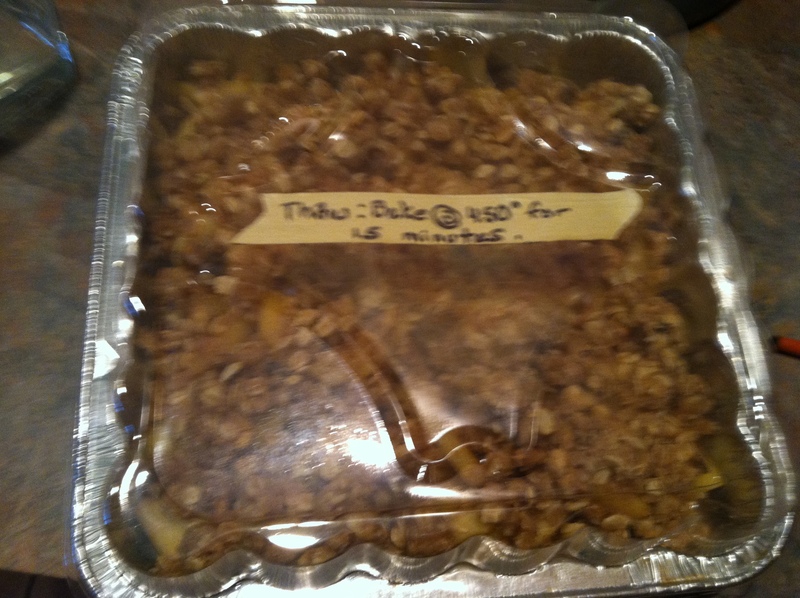 This entry was posted in Recipes and tagged apple crisp, apples, Blush Alaea sea salt, cast iron, cider, coring apples, walnuts. Bookmark the permalink. PS: It didn’t have any funky breakfast potato spicy flavors, but I think I need to make pork chops to absorb the apple juice glaze left in the cast iron skillet. Thanks for sharing. Come and add your link to the party when you get a chance…http://inherchucks.com/2012/09/19/whats-in-the-box-44/. Looking forward to seeing you there!